We’ve been hearing more and more about voice search recently. And while it is a very big deal, and it is already changing search, you do still have time to prepare for it. Some of the predictions for how rapidly voice search will be adopted have been, well… a little overstated. That’s not quite true. For starters, the stat is not actually from Comscore. It’s from a Fast Company interview with Andrew Ng, who was at the time the Chief Scientist at Baidu. Ng also included image search in his prediction for half of 2020’s searches, so not even he thought voice would be so widely used by next year. While there is some hype around voice search, most of the excitement is worth listening to. Voice search is a huge opportunity. You should pay attention to it and adapt your site for these new queries. And while we may not yet have a way to advertise via voice search, and voice commerce has only just barely gotten started, as adoption grows, voice will be increasingly important. Now is an ideal time to prepare for it. 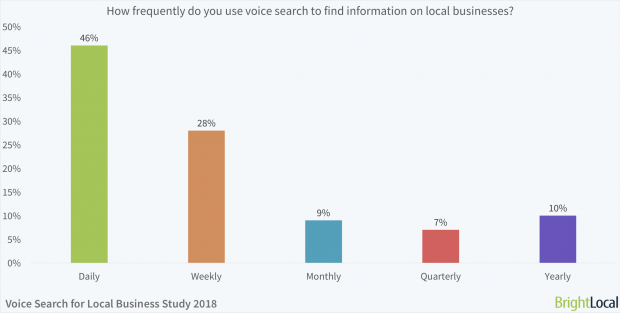 If you’re a local business, you might want to make voice search more of a priority especially. Of the 58% of consumers who use voice search at least once per year, 46% have done so daily. 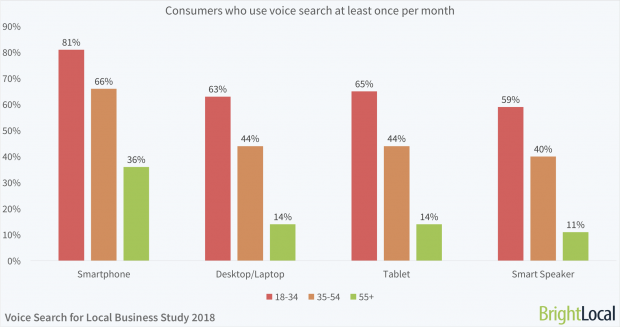 If we crunch the numbers a bit (.58 times .46), that works out to about 27% of consumers using voice search every day. So while voice isn’t yet the primary way people find things, for a certain set of consumers, it’s already a familiar habit. And as you would probably guess, the age of those heavy users skews young. This is compelling information, and could become a competitive edge for the right target audiences. But don’t go all in with voice search at the expense of your regular SEO work. All those mobile and desktop searches will keep happening. Most experts expect voice search to actually expand the number of searches being done. It is not expected to significantly cannibalize typed searches, or searches done through more traditional devices. That’s not the only reason to breathe a sigh of relief, either. Even if you do choose to prioritize voice search, most of the advice for how to optimize for voice search will include things you’re already doing. So your voice search optimization (“VEO,” as some refer to it) can, and should, complement your other SEO efforts. Optimize like You Would for Rich Snippets. 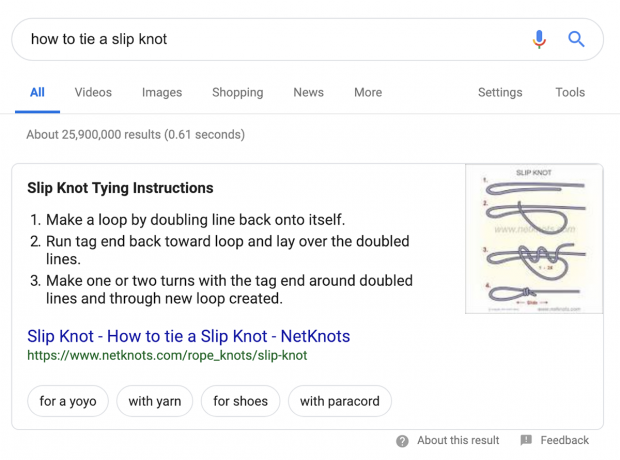 Ever heard of “position zero,” aka “rich snippets” or “rich answers”? They can come in a lot of formats, but here’s a simple example. It’s a text snippet. This is good news for SEOs. Many have already been optimizing their content to appear in rich answers. Getting some additional traffic from voice searches is an added benefit. Rich snippets are well-suited for what’s called “conversational content”. And given that we’re talking about, well… talking… it makes sense that voice search optimized content would shift more towards a conversational style and structure, and away from traditional, long-form content that is often easier read than spoken. So if you want more voice search traffic queries, write more of your content in that format… even if it means you have to summarize long content pages with a rich-answer type summary near the top of the page. Take that example of a text snippet. Notice how it has a very specific structure. It answers a specific question. The format of this content is question and answer. So if you’ve got an old “FAQ” (frequently asked questions) page, you might want to update it with an eye to answering voice queries. The answer is broken up into steps. This makes the content easier to read and remember. For voice device users, it helps them follow along much easier than if the instructions were all lumped together into one paragraph. They can also easily pause the audio while they complete a step, rather than having to listen to the entire set of instructions over and over again. The title tag for the page includes the question. 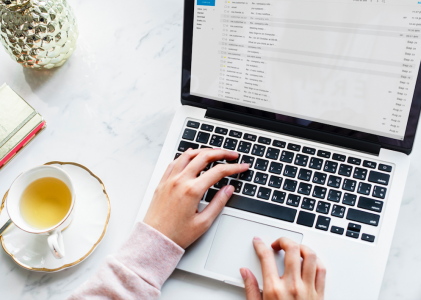 Consider rewriting some of your website’s title tags (where appropriate) so they are more “conversational” – more in a format someone might actually ask. For instance, you might want to use subheaders in blog posts that are questions, like “How should I clean my pool?” then have a section of content right below that answer that’s concise and useful enough to merit being the only answer Google (or Alexa, or Siri) might give. This is consistent with how Google has prioritized mobile users, and the speed required for the mobile experience. AMP may not be expressly required to appear in voice results, but it looks like it can help. And it will definitely help with your website’s overall experience. So this is yet another example of voice search optimization supporting other SEO goals. You’ll gain a competitive edge if you can implement AMP this year (preferably this quarter), too. Only 22% of marketers have implemented Accelerated Mobile Pages (AMP) in some capacity. If we want our content to be found, it has to be accessible to the search engines. This is a fundamental concept in SEO, and it applies to voice search, too. 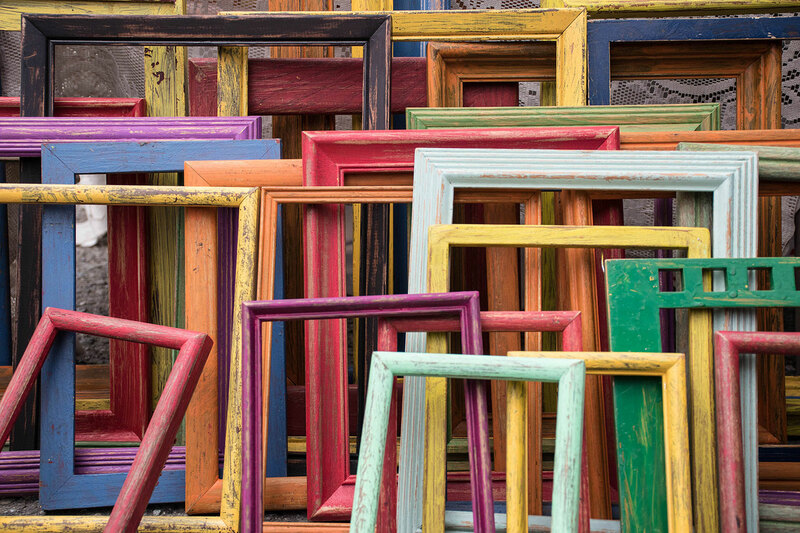 One of the best ways to make website content accessible is to use schema markup. Google has dozens of different schema markup formats, from articles and videos to the beta “speakable” format. The setup for these markups will be a little daunting if you’re not comfortable with code, and your site will have to meet eligibility requirements as a Google News Producer to qualify. Of course, Google is constantly updating its algorithm, so just because schema isn’t associated with voice search rankings now doesn’t mean it won’t be later. And Google isn’t the only voice-enabled device to optimize for. There’s Amazon’s Alexa, Apple devices, and other options. But Google has owned the bulk of the search market for a very long time, and it’s a key competitor in voice-enabled devices. All that said, proceed with caution if you use schema for voice search optimization. If it complements other SEO work, great. If not, it might not be worth the investment of time and resources. Experiment with Your Own Site and Different Voice-Enabled Devices. Voice search optimization is in its very early phases. So while all the things we’ve suggested can help, you will definitely pick up some more ideas simply by turning on a voice-enabled device and seeing if you can bring up your site. Simply using voice search yourself will teach you an enormous amount about what a good answer sounds like, and the types of questions people might ask, and how voice-enabled devices access sites. A little experimentation can also help you understand the conversational nature of voice interactions, which may become more important going forward. For instance, if you say to an Alexa device, “let’s chat,” it should be able to hold a conversation with you for half an hour or more. Could your website ever do that? Could a chatbot do that? It raises interesting questions about what content will be and will sound like in a few years. Voice search has hardly taken over the world, but it is already shaping search results and how users interact with our sites. Fortunately, the best practices for optimizing your site for voice search are complementary to optimizing your site for regular searchers, especially mobile searchers. So hopefully, you’re already doing most of what we’ve suggested here. 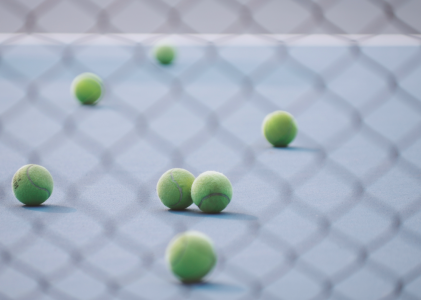 And if you aren’t… well, now you’ve got one more reason to follow these best practices. via UnSplash / Andres Urena. Screenshot taken by the author, February 2019.